Information to keep your house out of a fire incident report! This week we’re going to discuss heat lamps. Heat lamps use a light bulb to provide heat for some critter that needs higher than ambient temperatures to survive. Most reptiles and some amphibians require warmer temperatures than we typically see here in the northwest. Many birds require higher temperatures, especially young birds. Incubation operations for hatching eggs require heat lamps. 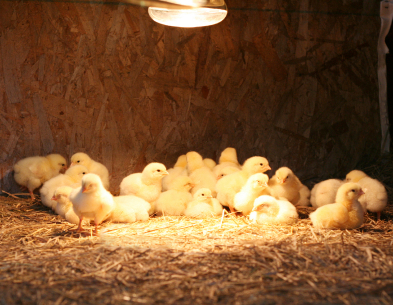 In many chicken operations light from heat lamps also help speed up growth processes. Often, farmers will use heat lamps to warm livestock during winter time cold snaps. The concept is solid and widely used in agriculture throughout colder climates. There are some hazards with heat lamps. We’ve seen lizards, chickens, pheasants and a pig all killed in fires caused by heat lamps. Additionally homes have been damaged and lost in these fires. In most cases the critter got involved in pulling down the heat lamp system so the fire occurred. Young birds reach a point in their development where they want to fly up and perch as high as possible. Many chicken farmers hang their feeders using a chain so the swinging feeder makes it difficult for young chickens to perch there. These birds often try perching on the suspended heat lamp and knock it down into the combustible bedding material (sawdust or straw). We’ve seen lots of chicken sheds lost this way and one fire that took about 50 golden pheasants. We’ve seen several lizards die in tanks where the bodies were all wrapped up in the cord. It appears they got tangled up and in an attempt to escape, pulled the lamp down into combustibles. We’ve also seen a pig owner install heat lamps during a winter cold snap, as well as a water bed heater for the pig to sleep on. We’re not sure if the pig walking on the water bed heater caused it to short, or if the pig chewed on a cord, or if it pulled a heat lamp down into the straw. The final outcome burned the pen, killed the pig, and threatened the shop and home. We’ve also seen laundry draped over the lizard tank catch fire. If you’ve got concerns about your heat lamp, stop and check it out. That few minutes may save your pets, your livestock, your barn, or even your home.